Thank you to everyone who made it out to the store this past weekend for our annual Spring Sale event!! We would now like to extend the sale to our online customers who couldn't attend!! 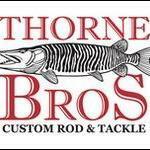 Please use the coupon code SPRING20 to save 20% on baits, rods, reels and clothing. And use the coupon code SPRING5 to save 5% on electronics and accessories!! Just enter the above code(s) at checkout and you'll receive your discount when you place an online order with us! Sale runs now through Sunday!! Thanks again for all of the support and have an awesome open water season! !